NB - Ramps on big rings are specially configured for combinations: 50/34, 52/36, 52/38, 53/39T. If you wish to use other configuration it will also work, but shifting will be slower and may require more "adjustments" of front dérailleur to be acceptable. 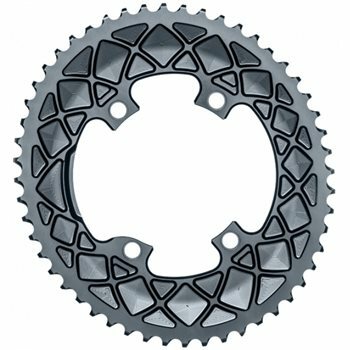 Also remember that front dérailleur can only accept max 16T difference between 2 chainrings - this is how Shimano and Sram designed them.